The New Play Control! logo. 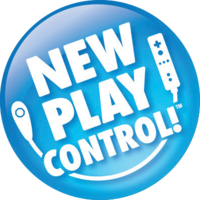 Oddly, North America never received the New Play Control! version of Pikmin 2. Instead, it received a delayed Nintendo Selects version, devoid of New Play Control! branding, in 2012. There is no difference between the two versions, however. The Korean Wii release of Pikmin also lacks New Play Control! branding. Pikmin 1 and 2 on Wii. Pikmin are back, and this time on Wii! The idea would be similar to the likes of Metroid Prime: Trilogy, but it was ultimately canceled, with Nintendo instead making each game be on a separate disc. Controls – list of controls for both versions. Wikipedia's article on New Play Control! This page was last edited on July 8, 2018, at 22:17.